Imagine you work in an office. You have been working there for about six months now, all is going well, you like the people around you, you know where everything is and who to ask for help. One morning you come in, and the key you used to open the door doesn’t work. Someone walks past and hands you a card, without a word, smiles and walks away. Ok, this card is different to any you have used before, how do you get it to work? You try and try, someone finally walks behind you, quickly does the trick for you and lets you in. You notice the office looks different, things are all in the wrong places. And someone was definitely playing with your chair! How can you work like this?! You look around, but nobody seems fussed, everyone is smiling at you, even though you have no idea what is going on. What does this have to do with weaning? Weaning is a change from something familiar, something your baby is used to, comfortable with, and ‘knows how it works’. Weaning is a big transition, it is a big step and a moment when everything changes – from the comfortable, familiar feeding sessions, it’s all new and different. How? Whether until now you have been bottle- or breastfeeding your baby, introducing a spoon is a very different thing. Your baby has no idea what it is, why it should go anywhere near his mouth, and what you want to do with it. Imagine you are blindfolded and someone is feeding you something with a weird stick. Spoons are a normal thing in our household, we don’t think about them anymore – and why should we? But it’s something our babies have never used, seen, and it is to go in their mouth – it’s pretty intimate. And that thing that is on the spoon? What is that?? Where is my warm, yummy milk? It’s different consistency. Different taste. Different texture. Different color. Probably also different temperature. It is as big a change, as it can be. Again, try and remember when you are invited somewhere and you end up being offered something that looks like nothing you’d ever eaten. If you have travelled a lot, it probably happens all too often – how do you react? What is your first thought? Until now, your baby was comfortably cradled in your arms while nursing, with the possibility of close body and eye contact. How can we keep this from changing too much, when we move on to the next stage? Of course it’s impossible to keep your baby in the same position that you did while breast- or bottle-feeding, but there are a few differences between the cuddled arm position and the high chair. Everything really is different when we start the weaning process. Change is something we need to get used to, something we need to tame so that we can work with the new conditions and new expectations. New passages have to form in our brain (that takes time), and we need to develop new habits – this, as we all know too well, takes a lot of time. How can you help? Emmi Pikler intensely focused on all the different changes that come along when weaning your baby, and she suggested that there should always be just ONE change at a time. So when moving from breast/bottle milk to spoon-fed solids there were many little steps in between. In terms of positioning the baby when offering solid foods Emmi Pikler suggested a slow transition process too. From the arms of the caregiver the children would move to a half-seating position on the lap. And then, once they were (i) able to sit up by themselves, and (ii) used to something other than breast or bottle, would she allow placing them at a little table. The chair was matched for size, so the child could get on and off by himself. When I first saw this little table – apart from finding it lovely and cute – I thought – I don‘t want my child to sit in there while I have dinner with my husband at our table. It felt like leaving him all one. Little did I know that at an age where a child is sitting at a table that small there is no common family meal. There is no „having dinner together“. Pikler‘s thought was the same as with the diaper changes – when a child has had our undivided attention and full presence during those feeding times, he would be able to engage in play on his own while we – the parents – enjoy our meal together. This sounds like a lot of work. Much to think through before starting with solids. And a long walk from breast- or bottle feeding to the meal at the family table. But in the end – this is what it is. A long journey. A big transition. From being closely cuddled up with just mom or dad while enjoying some warm milk – to sitting at a table with plates and cutlery, a variety of foods and the constant inner question of being full or not. 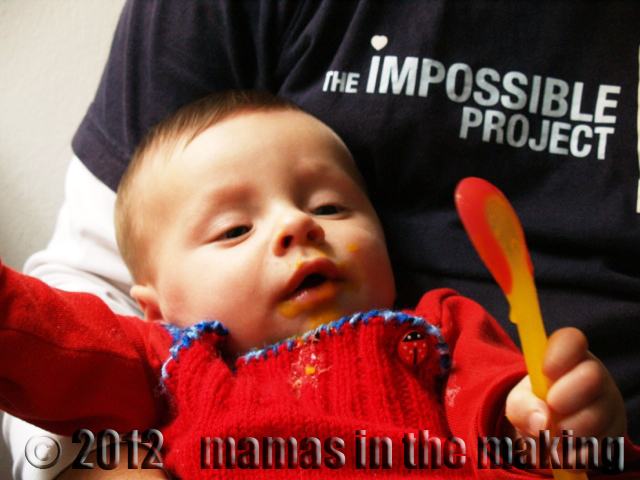 „Family meals are very, very rarely pleasurable when babies are included. Not only do babies not have any table manners, they need constant attention, create a mess, and I cannot see why such a tense atmosphere is desirable. This may seem very „old fashioned“ to many of you as it did to us too. 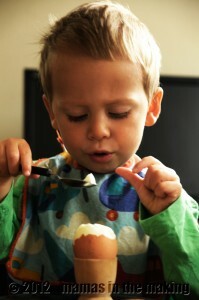 Now that our boys are 2,5 years old, can mainly eat by themselves and talk (sometimes A LOT), those family meals are finally becoming pleasurable and fun. During those many parent evenings Nadine attended in the past two years, and the number of talks Anna has had with other parents, feeding and mealtimes were a constant topic for many parents. Most of it has to do with our expectations, our own experiences as a child and our impatience. We are not denying that there may be problems and not all babies are happy to accept this whole transition at the moment we think is right. And not all babies accept the food we offer straight away. Or the spoon. Or the change in position. But what we are trying to offer here is a little food for thought. So we can understand our babies and lead and accompany them through the whole process mindfully and respectfully. To set a strong foundation for all those future mealtimes that are still to come when our children grow older. This post is a continuation of our thoughts and reflections on the day-to-day respectful parenting practices. We started with diapering, and now we move on to feeding. We will only focus on infant feeding here, and will try to write about feeding older children later on. Before we go on, there are some things we need to say. We have nothing to say about the choices you make with regards to breast or bottle. Or both. We have made our decisions, you have made yours. We respect that. There have recently (again) been a flurry of various posts and articles on one or the other side of the fence. We believe you have chosen, as we did, the best possible option for your family. If you are still thinking about it, the only advice we have is this: make an informed choice about the feeding option that you think will be best for the whole family. Yes, your baby is number one, but you are no less important. Look for information and support you need. If for some reason your choice is not working out, be open to other possibilities. Seek support, you deserve it and might need it. Look for the community that will value your choice and honour it, ignore the one that will judge it. Yes, we are aware of the issues that have been raised with regards to breastmilk and infant immune system. But one option that seems to be best, might not be best in the long run and for everybody. Basically, we believe that feeding your baby goes well beyond the whole fuss about bottles and breasts. That it is not about what you use to feed your baby, but about how you do it. 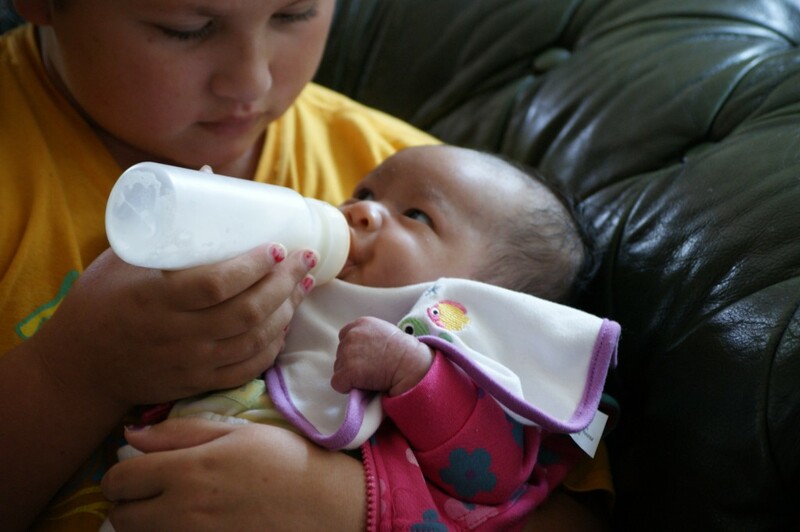 We believe there are two key issues that are involved in feeding an infant: nourishment and connection. And, putting breasts and bottles aside, we will focus on connection and relationship with your baby, which seem to be left out of a number of feeding arguments and debates (luckily, not all ). Because essentially, we believe that these two things are more important than any debate over anything regarding feeding. Also, they can be provided and enjoyed by any family member, anytime. Isn’t that a powerful thought? As you may have guessed, we will not have much to say about nourishment. This issue needs to be discussed with your doctor, if you have any concerns. Instead, we will focus on the connection you can create during those intimate moments when you feed your infant, and the respectful relationship you can build in those moments. Throughout this post we will talk about ‘feeding’ meaning breast or bottle, and ‘parent’ meaning anyone who is feeding the baby. You will feed your baby often. Sometimes the feeding will be long, for some babies it takes more time, some babies feed more during the night. If, like us, you believe that feeding is a great opportunity to spend quality time with your baby, it will work best if you can be as comfortable as possible. We have all probably done the weirdly-hunched-over feedings, or the barely-even-sitting feedings. If you are not comfortable, chances are the only connection you will be making is with your spine, or your arm. If you are comfortable and relaxed, he will be as well. It will also make it much easier to find pleasure in those wonderful moments. One thing that is important in finding a position for your baby to feed, is to always make sure he has an option of letting you know he’s had enough. Nowadays we tend to use every spare minute to interact with the world. We‘ve got laptops, tablets and mobile phones that let us fill every moment that could possibly filled with boredom. I dare to say that most of us find it very difficult to just sit down and relax. Not doing anything. Not watching anything. An evening with no TV, no internet, no telephone. Can you imagine this? Well. Nature is pretty awesome. It gives us the chance to get back to those precious moments. It gives us a baby that needs to be fed. Often. Sometimes for long periods of time. And while feeding this baby we can practice the not doing anything bit. Why? Maybe because it is healthy to relax all your senses. To not think. Not interact. Maybe because motherhood is an incredibly busy time, and moments of peace are precious. But maybe – and you already guessed that this might be our reason behind – because your child will feel the difference. He will feel you are there. Just with him. In deepest connection. You‘re feeding not just his stomach but also his soul. Doesn‘t this sound wonderful? It’s a different way of staying connected (the older meaning of the word ), without the use of any connecting devices. It’s just about the two of you. We’ve all been there when someone is serving us in the shop, selling us something, helping us fill in the documents, or helping us find the right person to talk to in the office, while all the while talking on the phone. Not a pleasant feeling, and often leaves us feeling as if we were a nuisance. Worse still – have you ever been out for dinner with someone and they constantly kept checking their phone? You know how it feels… Mealtimes together are great, not only because the food tastes nice. Sure, there will be times when you need to do something. To make a call. To answer an e-mail. But if you delay doing it until after the feeding, your baby will feel he got your full, undivided attention, and will be more likely to let you do your thing while he plays alone for those few minutes. How many parents love to watch their sleeping baby? Adore it. Love it to bits. Well great news: you can do this while he is awake. While he can feel you adoring and loving him. And once he‘s asleep – you can watch TV, check on the internet. Or simply close your eyes too. It does sound simple and we agree it isn‘t always that easy. But it’s worth a try. And you will see how deeply addicted you can get to it. So while feeding your baby try unitasking  And leave the multitasking abilities for other occasions, when you need them more. If you are in a loud or crowded place, move away a bit if you can. Turn your back to the crowds, and your face to your baby. If you’re having dinner with your friends, this time fully focussed on your baby might make a world of difference for everyone – your baby will be satisfied, and filled with your attention, you will be able to turn back to your friends and give them the attention they need. Will my newborn really care if I read messages on my phone while he is nursing with his eyes closed? We say yes. Because when will you see if he‘s opening his eyes for a moment? And while they might not see that far they can feel so much more. Remember how you can feel a person staring at your back. Why should newborns not be able to feel that way? And even if the baby is tired and half asleep and does not realize what you are doing – this is a great chance to practise. Because when they get older, they will ask for your attention. During mealtimes, during play. They don‘t always want you to interact with them – but they want you to be there and observe. And it does not have to mean you are glued eyeball to eyeball all the time while you’re feeding – but respect their need for connection, as well as yours. Undivided attention is one great part of the RIE principles / Pikler approach. It means to be with your child 100% while feeding, changing or bathing him. During those intimate and very precious moments. It gives you the time to fill up emotionally as well – let’s be honest, not only babies need our attention, we need theirs too. And it also gives us a chance to fill our babies’ attention needs, so that for those times when we need to do something else, like make a call, answer an e-mail or take a shower ) we can, because they know we will be with them again for the next feeding session. Feeding a baby is a basic need you are responding to. It is part of the bonding process. And as we said before – here you have the chance to feed more needs than the obvious one. Lots and lots of language! the picture above was kindly provided by: http://lindsaymitchell.blogspot.co.nz – thank you !